Discussion in 'Announcements' started by TheCainer, Apr 1, 2017.
me the fear of all people NightMare! Do not mention Judge Dredd or any of his fellow infidels unless they are spoken about with disgust and hatred. Hail, Dark Grand Judge JudgeDeath, Fealty hath been sweared. Omnishoot1 and DotHacker like this. Hail the Judge, Hail the Jury and Hail the Executioner. All those who fail to comply should be ended rightly. All hail Dark Grand Judge JudgeDeath! May his justice reign down on all living beings. Thanks all for participating in this years april fools! It was a last minute job for us, but I'm glad you all enjoyed it (and if you didn't, where's your sense of humor?). 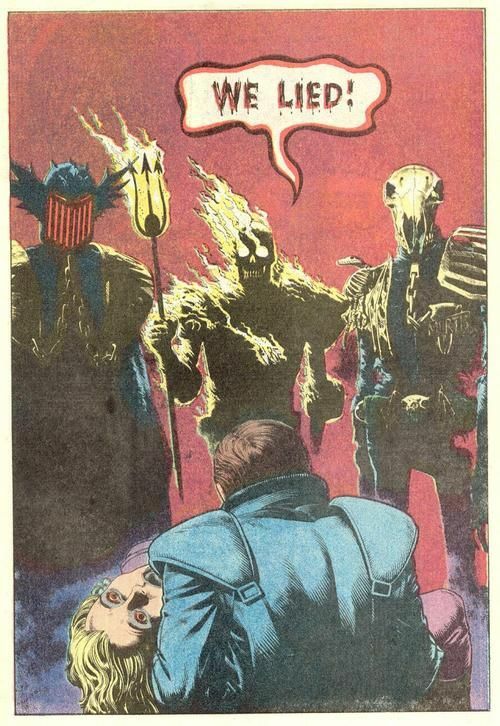 The Dark Judges are villains from the Judge Dredd-comic books. All renames were based on the Dark Judges, the ("good") Judges and the Judge Dredd-universe (the Dark Judges only consist of 4 judges* so there's not much to work with for an entire community). The logo was replaced with "Dark Judges"
The server was renamed to "Dark Judges"
Did you spot all the changes? What were your favourites? DotHacker, Omnishoot1 and Bookslide like this. btw: can you still give people the heretic tag? RAWR still hail the DARK JUDGE! Would be cool if heretics would get to keep their tags. So people not into joke would be like WUT? I prefer to keep the april fools jokes contained to april fools and not bloat the already big author pane with more unnecessary stuff.